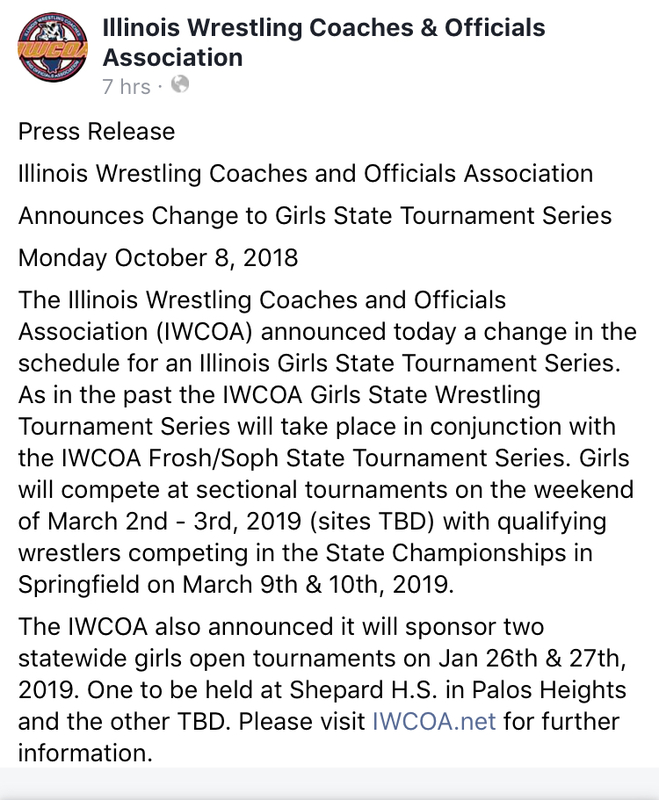 The IWCOA will hold a Girls Wrestling State Championships during the IHSA season on January 25-27, 2019. This summer, I asked coaches to join me to help create a Girls Wrestling League so we do not have conflicting tournaments for girls until the numbers warrant tournaments on the same weekend. The list of coaches that want to help Girls Wrestling in IL and set the standard for high school girls wrestling in the USA is above. Please email me at sgillespie@hf233.org if you want to add your name to the list. Please share this post to: spread girls Wrestling awareness, promote girls Wrestling, & grow girls Wrestling. Last edited by Coach Shannyn; 10-08-2018 at 08:17 PM. H.F.H.S. will be adding a girls bracket/division, for grades 9-12, to its 12.29.18 HF Frosh Invite. Please email sgillespie@hf233.org if you are interested. Last edited by Coach Shannyn; 09-11-2018 at 08:26 PM.